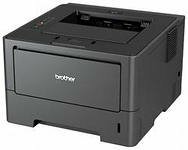 Brother HL-5470DW is a black and white laser printer. Has a good print resolution 1200 x 1200 dpi, maximum A4 format. Print speed is very high and reaches thirty-eight pages per minute. Feed paper from 300 sheets, up to a maximum 800 sheets. There may be two types of cartridges type TN-3330 and TN-3380. Your printer has three interface, Ethernet (RJ-45), Wi-Fi 802.11n and USB 2.0. This gives him flexibility. As you can connect with your computer wirelessly via Wi-Fi.